Gillette—the best a gamer can get? 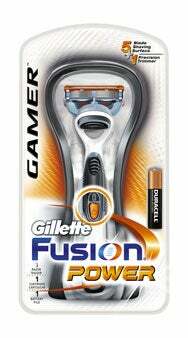 Gillette recently unveiled the Fusion Gamer and Fusion Power Gamer, two new variations of its men’s razor. The canny Web site, television ads, and packaging were put together specifically to appeal to young men who like to play video games. No, that’s not a joystick. It’s a razor Gillette is targeting at gamers. Having played video games for most of my life and having shaved (my face and—once my hairline receded sufficiently—the rest of my head) for a fair amount of it as well, I was naturally intrigued by the Fusion Gamer. Either by coincidence or some sense of regional loyalty (I’m a Boston boy, and Gillette is based here), I’ve used Gillette products for most of my adult life. But I confess that the whole marketing campaign around the Fusion Gamer has mostly passed me by. I think it’s a sign of how old I’m getting. Disposable razors represent a multi-billion dollar global industry, largely dominated by Procter & Gamble (P&G) brand Gillette and Wilkinson Sword’s brand Schick. Gillette constantly strives not just to stay ahead of the competition but also to interest its own customers into trying new things. So it’s little wonder that we see the Fusion reinvented three years after its introduction, as Gillette tries to appeal to new customers. The Fusion, which debuted in 2006, sports five blades, a lubricating strip and a sixth blade on the back of the head for precision trimming. It’s been quite popular since its release, and Gillette has diversified the line with a “Power” version that sports a battery which delivers “micropulses” to the cutting surfaces, an effect that Gillette claims delivers a closer shave. And so we have the Fusion Gamer and Fusion Power Gamer. There’s no difference between these products and their non-gamer counterparts; it’s a bit like the Fusion Phenom, another packaging variant that’s supposed to appeal to sports fans. What’s inside is exactly the same, and compatible with, other Fusion products. The Gamer is what P&G refers to as a “color change”—the branding on the package has been updated, and P&G has even invested some money in marketing the product specifically at the 18-to-34 year old male demographic that the company thinks this will appeal to. Well, I guess that explains it, then. As immersed as I am in gamer culture, I’m 39. The ads just must be invisible to me. Gillette is backing up their interest in appealing to gamers with more than just a snazzy Web site and a package that says “Gamer” down the side. They teamed up with EA Sports, IGN and other companies to sponsor and coordinate a gaming championship that concluded at the beginning of February at the University of Central Florida Arena. And that shows a canny bit of marketing on Gillette’s side, even if I’m grousing about being left out of the loop. For years, Gillette has sought to work its way into the hearts and minds of young men at college campuses around the country, understanding full well that with the right combination of advertising and sponsorship, it’s possible to build brand loyalty for life. Of course, the stereotype of a gamer is some guy with poor hygiene and no social skills who just wants to stay in his parent’s basement all day and play Halo 3. That’s not true at all—a long time ago, gaming became a mainstream pastime, something that “normal” people, not just weirdos—did en masse, including lots of young (and older) men with grooming skills. So leave it to a mass-marketing organization like P&G to figure out how to exploit this to its own ends.